Charger Not Included. It can be bought separately if needed. This is new variable voltage battery from KangerTech and change between 3 voltages with a click of a button! The EMOW 1300mAh Variable Voltage Battery from Kanger is a powerful battery that will give you hours of vaping pleasure, usually approx. 1.5 days. These batteries are made of shiny stainless steel that gives it a sleek look as well as high-quality durability and is available in black and stainless steel. Its variable voltage feature also allows you to adjust the voltage of your battery to accommodate different clearomizers and e-liquids. This gives you the opportunity to have more control of your vaping experience. The voltage range of this powerful lithium ion battery is 3.7V to 4.8V. Simply rapidly depress the button 5 times to cycle through the voltage levels. There are 3 voltage settings: 3.7V (red light), 4.2V (green light), 4.8V (white light). FYI: No two clearomizers and tanks are the same, which means that each clearomizer will function differently depending on the voltage of the battery. Smaller, disposable clearomizers tend to function better at lower voltages whereas more sturdy clearomizers made of materials such as Pyrex glass and stainless steel will function better at higher voltages. The same holds true when it comes to e-liquid. E-liquids made with a higher level of VG are typically thicker and vape better at higher voltages, e-liquids with a higher PG level tend to be thinner and function just fine at lower voltages. The Kanger EMOW 1300mAh Variable Voltage Battery is a classy, yet durable choice for anyone in search of a great battery with a lengthy lifespan and sleek look. It gives lots of power up to 1300mAh which is double what the EVOD is capable of. The voltage can adjusted so that you can set it to your favorite levels. You can choose between 3.7, 4.2 and 4.8 volts and the level is clearly shown by an LED light. It has built in safety features such as having to click five times to switch it on and off, short circuit protection, cuts off after the power button is pressed for ten seconds and shuts off if the voltage goes below 3.2 volts. You can choose between black and stainless steel colors. The EMOW battery comes with 5-click protection: Generally, the battery is shipped in the off position. In off position, the battery will not function even when pressing the button. To turn on battery, press manual button 5 times within 2 seconds. You will see colorful LED blink 3 times. To turn off battery, press manual button 5 times within 2 second as well, the colorful LED will also blink 3 times! "5-click protection" can protect the battery from being activated when you do not want or do not use it. No more firing in your pocket! 1. Please fully charge the battery before using to maintain a good battery life span. 2. The initial charge should be for 8 hours. After that, all additional charges should be for no more than 4 hours at a time. Magic Mist will not be held responsible or liable for any injury, damage, or defect, permanent or temporary that may be caused by the improper use of a LI-ION battery. Please have a basic understanding of the batteries you are using and how to care for them properly. 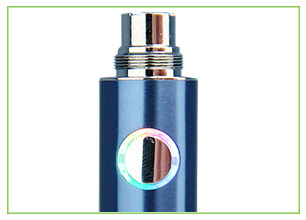 510 Threaded: Compatible with all of our Joye eGo Series atomizers and cartomizers, 510 Series clearomizers and tanks. Lockable: Press the button 5 times within 2 seconds to lock or unlock the battery. The battery LED will blink when switching modes. 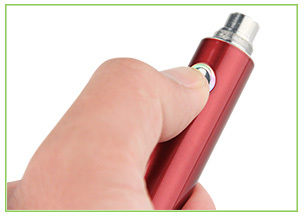 When the battery is in lock mode, the button is disabled and the battery will not power an atomizer or cartomizer. There is a power /activation button on the battery. By clicking five times it powers the device on/off. So far, so good. I have only had it a short time.